Missing teeth are a real problem in many ways. Depending on how many teeth you are missing, you may feel self-conscious about your appearance, experience difficulty while eating, speaking and even maintaining proper oral health. Also, when gum tissue is unduly exposed, it becomes at greater risk of developing infection or gum disease, which can lead to further tooth loss. There are a handful of options to replace your missing teeth, including dental bridges and dentures, but none are as natural or effective as permanent dental implants. Dental implants are small titanium posts that are surgically implanted directly into a patients jaw bone to replace the root of a tooth. Instead of only restoring a tooth above the gum line, a dental implant goes beneath the gum surface to provide a durable, sturdy and secure base for prosthetic teeth. This has the added benefit of giving support to your jaw bone and helping it remain healthy. 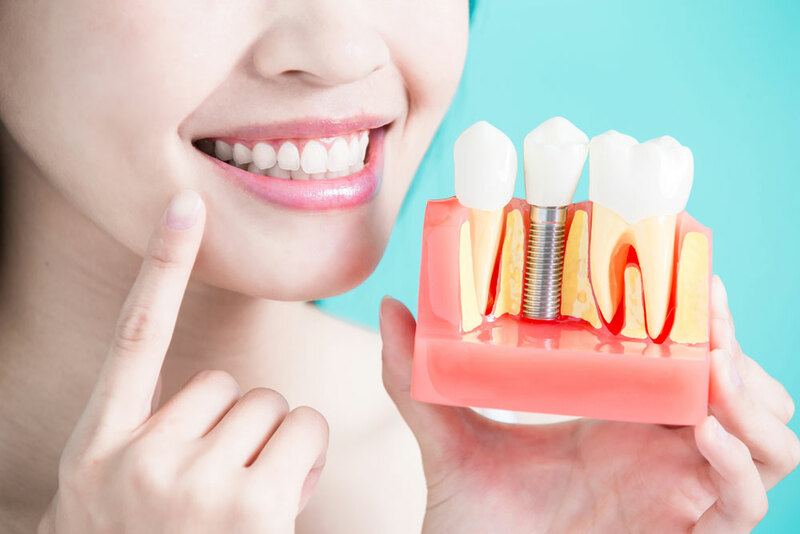 Dental implants are surgically installed via a small incision that’s made in your gums, which allows the titanium post to be implanted in the bone of your jaw. Once the implant has been installed, a 4 to 6 month healing period is required for the implant to securely bond with the surrounding jaw bone and for the gums to heal properly around it. Once the implant has fully integrated into your jawbone, your dentist will be able to place a custom fabricated prosthetic tooth onto the implant post, such as implant retained dental crowns, bridges or implant retained dentures. Implant retained prosthetics (crowns, bridges, dentures) are great for patients who do not have enough healthy teeth remaining to support crowns or bridges, or those looking for a more natural and permanent solution. 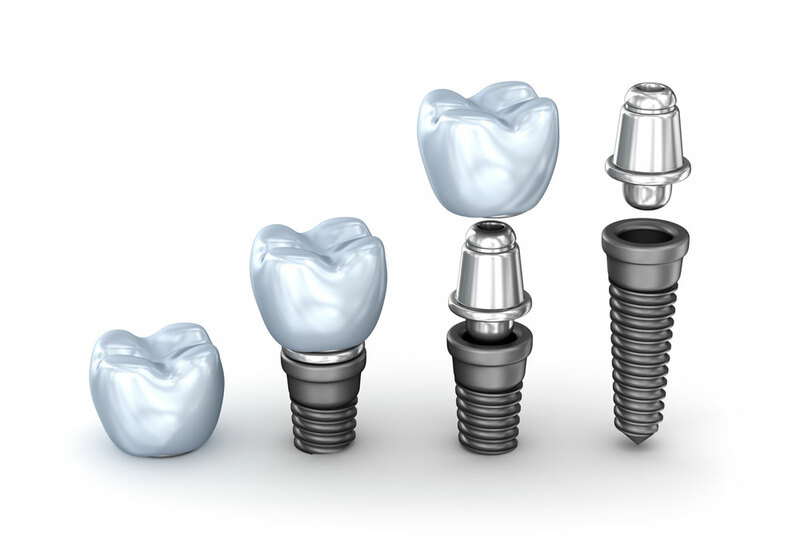 Instead of crowns encapsulating an existing tooth, or a dental bridge being supported by neighbouring teeth – dental implant retained prosthetics are anchored securely to a dental implant, while remaining healthy teeth are left untouched. The same is true for implant retained dentures, which instead of relying on suction or dental adhesives, are secured to the jaw bone via the dental implants and act just as natural teeth would. Dental implants are the costliest tooth replacement option, but are also the most effective. 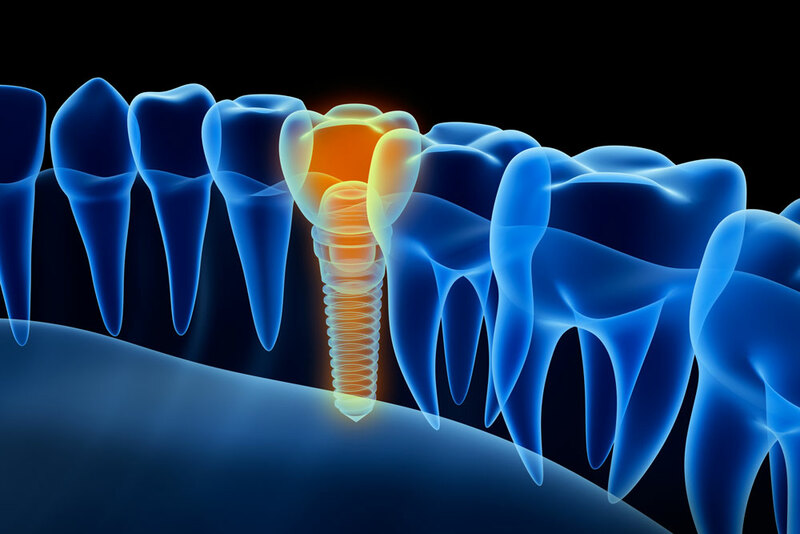 A dental implant tooth restoration will be as secure as your natural tooth. There is no removal for cleaning necessary, no slipping (dentures) or any other inconvenient issues associated with other non-permanent dental implants. Dental implant retained prosthetics can last for decades with a regular oral hygiene routine and eliminate the hassles associated with removable prosthetics. dentist to explore the dental implant options available to you. Let us help you with your dental needs, always with courtesy and compasion. Website By: DIT Web Solutions Inc.